That doesn’t seem right. In fact, I would assume that you would have –10, –11, and 1 as the values. However it doesn’t work. Why? It’s a bug. 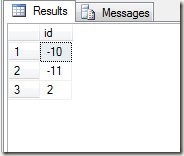 This is actually listed on Connect, and marked as “resolved”, which makes me think that the code has been marked for SQL 11 and corrected. It returns 8, and 9, because when you insert a specific value for the identity that is large than the current value, the current value is set to the inserted value. I’ve used lots of identities, but never messed with negative values, so this surprised me. There’s no reason why you can’t use them, just be aware that if you start an empty table with SET IDENTITY_INSERT on, you could end up skipping the “1".